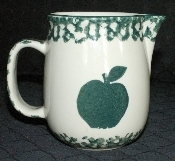 Vintage From Paul is pleased to offer this simply marvelous Tienshan Folk Craft Green Sponge Apple Creamer. Tienshan Apple has a creamy stoneware body accented with green sponge work at the handle and rim. The focal point however is the green sponge rendering of an Apple. Each of the available Tienshan Apple creamers is in Mint Condition with no chips, cracks, scratches, crazing or yellowing. The bottom of theTienshan Folk Craft Green Sponge Apple Creamer is marked with; " Folk Craft Apple by Tienshan Made in China"
The Tienshan Folk Craft Green Sponge Apple Creamer stands 3-7/8 inches in height and it has an eight (8) fluid ounce capacity.